WASHINGTON (PAI) – At first, it was a one-union crusade, but in the first example of what labor’s legions, with a huge amount of added allies, can do, the Communications Workers’ Democracy Initiative caught fire. And it’s not stopping after its first big win, forcing the U.S. Senate to change part of one of its most undemocratic requirements, the filibuster rule. 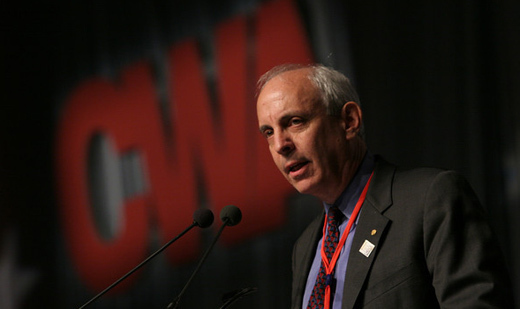 CWA President Larry Cohen and the union’s team created the Democracy Initiative after seeing how a combination of political factors – Republican filibusters, anti-Hispanic venom, voter suppression and U.S. Supreme Court rulings – combined to thwart pro-democracy/pro-worker legislation and initiatives. Prime among the victims of the obstructionism and right wing: The Employee Free Choice Act, the labor-backed bill designed to help level the playing field between workers and bosses in union organizing campaigns and in negotiating first contracts. Other groups and unions had campaigned for comprehensive immigration reform, for voting rights, against the Radical Right and for workers’ rights for years. CWA’s drive went two steps beyond: It linked all the factors together, and it consciously set out to round up a huge group of allies. “Ultimately these factors – outsized political spending, voter suppression and obstruction of legislative debate and action – diminish the fairness and effectiveness of the political process and discourage robust civic participation essential to the American democratic ideal. Consequently, our democracy is in distress,” the campaign’s statement says. 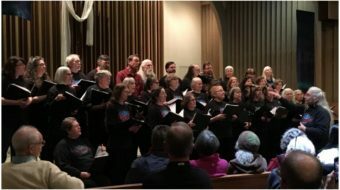 Their solution was to get voting rights and civil rights groups, unions, environmental groups, citizens groups, pro-worker faith groups and other pro-democracy organizations out of their individual “silos” and work together. Before that, each group would give the others’ causes lip service, but nothing more. 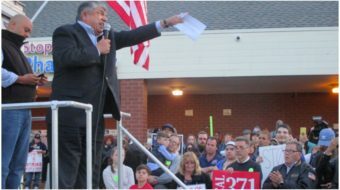 By uniting them against a common foe – corporate corruption and control of the political system and the awful results that produces – CWA convinced more than 51 other groups to work together. “We seek a vibrant democracy, free of the corrupting influence of corporate money, where everyone can participate fully and freely in our democratic process, where every voter has a voice, and where our policymakers are accountable to the people and the public interest. Achieving success in civil rights, climate change, women’s rights and worker’s rights, is inextricably linked to the victories on these core issues of our democracy,” their statement said. But first they had to convince their allies that an “inside baseball” issue – the Senate’s filibuster rules – matter. Because those rules block everything else. “Everything” included a full and functioning National Labor Relations Board. GOP filibusters, sustained by business backing and an absolute minority of at least 41 votes – the minimum needed – blocked President Obama from filling all five seats on the board, hamstringing it. The filibusters also blocked Obama nominees for other key posts, including the new Consumer Financial Protection Bureau and the Environmental Protection Agency, as well as dozens of federal judges. The several hundred GOP filibusters – an all-time record – helped. The Republicans, scheming to destroy the president, blocked virtually everything, giving each group in the coalition a cause to push through overturning the Republican talkathons. But the NLRB, the EPA and the consumer bureau led the list. And finally, the pressure worked. Senate Majority Leader Harry Reid, D-Nev., fed up himself with the filibusters, and under – he admitted constant pressure from Cohen and CWA’s allies – changed the rules to allow a simple majority vote to end filibusters on nominations of executive branch officials and lower-court judges. But the Democracy Initiative has no intention of resting on its laurels. That win still leaves the filibusters alive against legislation and against Supreme Court justices. There are other snags in the rules that still lie in ambush. And once the rules change, there’s the substantive legislation and change the Democracy Initiative is campaigning for: Workers’ rights, restoration of voting rights, curbing the Supreme Court/GOP-caused influence of right-wing and business cash on elections, and comprehensive immigration reform. It’s a tall order. But they think they can win. They just racked up another small victory – which, due to the rules, won’t last: The Senate Judiciary Committee approved a proposed constitutional amendment again allowing Congress to regulate federal campaign financing. “We will build this democracy through long term and short term goals aimed at opening democracy and shifting the center of political engagement from moneyed interest to the people,” the creators of the Democracy Initiative say. “We will build a power network aimed at achieving universal access to the ballot box, shifting the burden of voter registration to states, passing Senate rules reform, and curbing the influence of money in our electoral system.